The paper presents a renewed Habermasian view on transnational multi-stakeholder initiatives (MSIs) and assesses the institutional characteristics of the Equator Principles Association (EPA) from a deliberative democracy perspective. Habermas’ work has been widely adopted in the academic literature on the political responsibilities of (multinational) corporations (i.e., political corporate social responsibility), and also in assessing the democratic qualities of MSIs. Commentators, however, have noted that Habermas’ approach relies very much on ‘nation-state democracy’ and may not be applicable to democracy in MSIs—in which nation-states are virtually absent. We argue that Habermas’ detailed conceptualization of the institutionalization of deliberative democracy can be applied to transnational MSIs if these initiatives can be said to have their own ‘dèmoi’ that can be represented in associational decision-making. Therefore, we develop a definition of the dèmos of an MSI based on the notion of collective agency. Subsequently, we explain how Habermas’ approach to democracy can be applied to MSIs and show that it has more to offer than hitherto has been uncovered. Our illustrative analysis of the EPA confirms the criticisms regarding this MSI which have recently been articulated by researchers and practitioners, but also yields new findings and possible avenues for the further development of the EPA: That is, although our assessment suggests that the EPA in its current state is still far from being a democratic MSI, the possibility of a sensible analysis of its democratic character indicates that transnational MSIs can, in principle, help to fill governance gaps in a democratic way. The Equator Principles (EPs) are a voluntary and self-regulatory corporate social responsibility (CSR) initiative in the finance industry. In particular, they are a credit risk management framework for identifying, preventing, addressing and mitigating adverse environmental and social risks and impacts in project finance transactions. The EP-framework can be considered as a multi-stakeholder initiative (MSI) since several stakeholders, such as financial institutions, international organizations and NGO–watchdogs, have been involved in the drafting and reviewing process. In addition, multiple stakeholder groups are also addressed by the principles—for instance, project developers and operators—and/or are otherwise affected by their application, e.g., local (indigenous) communities. The EPs are, furthermore, an example of transnational ‘soft-law’ regulation. That is, they help to fill ‘institutional voids’ (i.e., governance gaps and regulatory vacuums) in situations where national governments or supra-/international bodies are not willing or able to effectively regulate business conduct, especially in terms of environmental, social and human rights issues. The EPs thus regulate a field that has often been considered the exclusive domain of nation-states (Kobrin 2009). Yet, in contrast to democratically organized nation-states which in principle articulate the collective will of their dèmoi, the Equator Principles Association (EPA) does not obtain its legitimacy through the democratic engagement of all those who are submitted to its regulations. Recent academic research (Lazarus 2014, 2015; Wörsdörfer 2014; Hennig and Wörsdörfer 2015) has shown that, despite various progresses made in the recent past (cp. the latest version of the EPs with its predecessors), the EPA still lacks adequate stakeholder engagement rules at the associational and individual member level. Also, a reform commission set up by the EPA itself has made proposals for improving the engagement of stakeholders, such as NGOs, civil society organizations and project-affected communities (Lazarus and Feldbaum 2011, 10; BankTrack 2011, 10; 2012). So far, however, no substantial reform measures have been taken: The so-called Equator banks or Equator Principles Financial Institutions (EPFIs) are still the primary actors with regard to the (further) development and implementation of the EPs, while arrangements for the engagement of other stakeholders in EPA-decision-making continue to be mainly absent. As a consequence, some commentators (Wörsdörfer 2016) worry that the EPA displays a ‘democratic deficit’ (Scherer and Palazzo 2011). Establishing whether an MSI like the EPA actually suffers from a democratic deficit requires understanding the democratic potential of such transnational CSR-initiatives in general. Yet, in the current business ethics literature, this topic has received scant attention. It is true that many authors address the political responsibilities of corporations (Hussain and Moriarty 2016; Mäkinen and Kourula 2012; Néron 2010; Scherer and Palazzo 2007, 2008, 2011; Scherer et al. 2009; Whelan 2012); they also emphasize that these responsibilities may become particularly salient when businesses engage in the development of MSIs and other forms of (trans-)national regulation (Pies et al. 2013). However, so far only Mena and Palazzo (2012) and Hahn and Weidtmann (2016) have started to flesh out democracy for the specific case of MSIs. Following the seminal work of Scherer and Palazzo (2007, 2008, 2011), Mena/Palazzo and Hahn/Weidtmann take Habermas’ approach to deliberative democracy as a starting point. They propose criteria such as inclusion of stakeholders, procedural fairness, transparency of processes, and output legitimacy for the democratically legitimate development of regulations in transnational MSIs that can, in principle, serve for analyzing the democratic qualities of the EPA (and other MSIs) (Mena and Palazzo 2012; Hahn and Weidtmann 2016). Thus, Mena/Palazzo and Hahn/Weidtmann recognize that transnational regulation, by means of a multi-stakeholder network, creates a specific context for the political responsibilities of corporations—a context that changes their responsibilities. In MSIs, corporations share responsibilities with regard to environmental, social and human rights issues with other stakeholders, such as NGOs. Corporations are embedded in a self-regulating network that, as a whole, cares about its legitimacy with regard to its own members and to communities, organizations and persons that are affected by its rules. This responsibility is different from the situation in which a ‘solitary’ corporation fulfils state-like functions and should be held responsible for regulation with regard to deliberating citizens.1 The situation created by the introduction of a multi-stakeholder network demands a specific institutionalization of accountability, which can be inspired by Habermas’ conception of deliberative democracy, but also requires a transformation of his work. Mena/Palazzo and Hahn/Weidtmann do not explain, however, in which way their approaches follow and/or transform Habermas’ theory, which was not meant for a direct application to transnational multi-stakeholder networks. Besides, neither Mena and Palazzo (2012) nor Hahn and Weidtmann (2016) take full advantage of Habermas’ detailed conceptualization of the institutionalization of deliberative democracy: Habermas (1996) makes clear that the democratic qualities of law making in modern nation-states depend on the institutionalization of a constellation of five differentiated but connected regulative elements: (1) deliberative preparation in public discussions; (2) representative decision-making about regulation; (3) implementation by an administration; (4) adjudication of regulation; and (5) explicit meta-regulation of these four elements in a constitutional framework. These elements and their interactions are central to a Habermasian approach to the institutionalization of democracy and promise a further elaboration of a framework for analyzing MSIs. The purpose of this paper is to discuss a transformation of Habermas’ conceptualization of deliberative democracy to make it available for assessing the democratic qualities of MSIs and subsequently show its usefulness in an analysis of the EPA’s democratic qualities. To transform Habermas’ conceptualization and make it available for the analysis of MSIs, we must pass a hurdle that was indicated by Mäkinen and Kourula (2012) as well as Whelan (2012). They note that Habermas’ conceptualization relies very much on ‘nation-state democracy’ and is not directly applicable to MSIs and other transnational regulators. According to Habermas, the legitimacy of transnational regulation should be enhanced through the engagement of nation-states which are able to democratically represent their dèmoi (Habermas 2009). Seen from this perspective, stakeholders would at best be indirectly democratically engaged as members of national dèmoi: On Habermas’ account, the democratic qualities of an MSI would depend on the (level of) democracy in the nation-states that are engaged (and not on the democratic institutions of the MSI itself). To take this hurdle, and to explain how Habermas’ regulative elements of deliberative democracy can be applied to the direct engagement of stakeholders in an MSI, we argue that an MSI is a bounded community with its own dèmos. We develop an approach for identifying the dèmos of an MSI on the basis of the notion of collective agency (List and Koenig-Archibugi 2010; List and Pettit 2011): The community of authors/addressees of MSI-rules can be seen as a collective actor that constitutes a dèmos. Other stakeholders that are affected by an MSI but are not addressed by its rules do not belong to this dèmos. Here, our approach reveals a narrower account of the dèmos than has been presupposed by Mena/Palazzo and Hahn/Weidtmann. Nevertheless, Habermas’ general discourse principle (Habermas 1996, 107) requires that these otherwise affected stakeholders should also be engaged in the discussions of the political community and considered in decision-making. Taken together, the elaborations in this paper provide a deliberate argument for identifying the dèmos of an MSI, a Habermasian set of democratic legitimacy criteria for the direct engagement of the stakeholders that belong to the dèmos, and a solution for involving the otherwise affected stakeholders. We thus generate a framework that offers more versatility in the identification of relevant stakeholders and their engagement in the MSI, and considerably more breadth in the analysis of the institutionalization of democracy than has hitherto been proposed. Our framework is then applied to assess the democratic qualities of the EPA: The paper first identifies the stakeholders that make up the dèmos of the EPA and the otherwise affected stakeholders that are not included in the dèmos. Subsequently, it examines whether and how Habermas’ five elements of deliberative democracy could be institutionalized in the EPA. Our analysis illustrates that Habermas’ five regulative elements of deliberative democracy are not only relevant for nation-states, but can, in principle, also be instantiated in MSIs. Moreover, the possibility of this instantiation indicates that such initiatives cannot only help to fill governance gaps and regulatory vacuums; they can also be democratized and thus help in overcoming democratic deficits in transnational regulation independent of nation-states. Our illustrative analysis shows that the EPA is still far from being a democratic multi-stakeholder CSR-initiative and yields new findings and possible avenues for the further development of the EPA. Our assessment suggests that transnational MSIs can, in principle, help to fill governance gaps in a democratic way. The paper is structured as follows: In the second section, we develop a Habermasian framework for the assessment of the democratic qualities of the EPs and similar MSIs along the lines indicated above. In the third section, we analyze the EPA by means of this framework and identify structural reforms pertaining to the further embedding of democracy in the EPA. In the fourth section, we briefly summarize the main conclusions and indicate how our Habermasian conceptualization of democracy contributes to the academic literature on MSIs. Establishing whether a ‘democratic deficit’ (Scherer and Palazzo 2011) actually exists in the EPA and, more generally in MSIs, requires a conceptualization of the characteristics that make an MSI democratic. This raises the question as to which governance structures are necessary to render an MSI, a democratically legitimate regulator for the stakeholders submitted to it. We answer this question from a Habermasian perspective of deliberative democracy. Roughly speaking, the ideal of deliberative democracy entails that all those that are submitted to a set of rules should also have access to communicative deliberation about the development of these rules (Benhabib 1996; Dryzek 2010; Habermas 1996). Deliberative democracy is largely procedural in nature and imposes a minimum of normative foundations. Therefore, it is considered helpful for the political dimension of business in contemporary society that is characterized by a plurality of conflicting substantive views about morality and the good life (Scherer and Palazzo 2007, 2011). Especially, Habermas’ approach to deliberative democracy is often applied for understanding political demands on business. Scherer and Palazzo (2007, 2011) mention his approach to democracy—and particularly his recent pragmatist variant (Habermas 1996; Scherer and Palazzo 2007)—as a possible orientation for the discussion about political responsibilities in domains where the distinction between public and private spheres is blurred (Kobrin 2009). However, Habermas’ work cannot be applied to transnational MSIs without some modifications. Mäkinen and Kourula (2012) as well as Whelan (2012) note that the Habermasian approach to deliberative democracy relies to a considerable degree on the democratic structures of traditional (Westphalian) nation-states2 (Bohman 2007; Scheuerman 2008). For Habermas, in the present ‘post-national constellation’ (Baur 2011, 21ff. ; Habermas 2001; Scherer and Palazzo 2008; Wettstein 2010, 279ff. ), democratic legitimacy can only be reliably obtained through the democratically organized decision-making structures of nation-states (Whelan 2012, 726f.). Habermas (2009) does not see a real alternative to the rather well-defined peoples that form the ‘dèmoi’ or the ‘citizenries’ of nation-states as a basis for democratic deliberation and representation. The democratic legitimacy of international (e.g., extradition treaties), supranational (e.g., EU-regulation) and transnational regulations (e.g., EPs and other soft-law MSIs) relies in his opinion on the participation of national governments, which are able to democratically consult their dèmoi. If Habermas’ account would be taken seriously, this would imply that the democratic legitimacy of the EPs would have to be grounded on the scattered dèmoi of many nation-states and the path of the engagement of these dèmoi would be paved with several obstacles. On this picture, stakeholders would be indirectly engaged as participants of the democratic processes of nation-states and the complexities associated with this indirect involvement would render the prospects for democracy in transnational MSIs rather dim (Martens 2014). Moreover, one of the main reasons for establishing the EPs (and other MSIs) is precisely that the governments of many nation-states have difficulty taking joint (collaborative) action on socio-environmental risks in project finance (and other sectors), and it seems likely that these problems would persist when nation-states would play a central role in MSIs such as the EPs. First, both Mena/Palazzo and Hahn/Weidtmann do not explicitly address the question as to what would be the dèmos of an MSI, that is, which stakeholders should be engaged in MSI-decision-making to realize democratic legitimacy. They simply assume, without further discussion, that all those addressed and affected by the rules of an MSI should be included in the discussion and decision-making (Mena and Palazzo 2012, 537; Hahn and Weidtmann 2016, 101). Such a proposal, however, cannot (easily) be brought in line with the way Habermas analyzes the boundaries of the dèmos. Habermas’ democracy principle (1996, 110) restricts the dèmos to the members of a political community, which attempts to regulate itself by means of law. This implies, we argue, that from a Habermasian perspective only those addressed by the rules of an MSI, and not those that are merely affected by it, would belong to the dèmos.3 This position constitutes an alternative to the views held by Mena/Palazzo and Hahn/Weidtmann. It may be true that the prospects for democracy are dim if the dèmos of an MSI is considered to consist of an amalgam of the dèmoi of all relevant nation-states and if stakeholders are indirectly engaged via national representative democracy. And, indeed, a potentially successful response to this may be to conceive of democracy in MSIs along the lines of the direct democratic engagement of stakeholders (as Mena/Palazzo and Hahn/Weidtmann propose). However, following this path requires a systematic Habermas-inspired answer to the question as to who should make up the dèmos of an MSI if democratic legitimacy is obtained through the direct engagement of stakeholders—an answer which has not yet been given. Meta-regulation of these four elements in a constitutional framework. Hahn and Weidtmann (2016) restrict their conception to the first two elements, that is, public discussion and decision-making. Mena and Palazzo (2012), on the other hand, indicate that enforcement in the sense of practical implementation and verification of rules is important. Democracy apparently demands—besides the influence of the addressed on decision-making—certain features of rules that make them enforceable (Mena and Palazzo 2012, 542), as well as the ability to monitor and sanction their application. Although Mena and Palazzo find enforcement important, they focus on monitoring, because they consider substantial sanctioning difficult to achieve in the context of MSIs (Mena and Palazzo 2012, 542). We believe, however, that an analysis of implementation of rules in transnational MSIs could gain precision by integrating some of Habermas’ insights regarding the importance of administration and adjudication for the realization of democracy in an analytical framework for MSIs. We propose to view specification, monitoring and sanctioning as functions of administration, and interpretation and sentencing to create security and justice as functions of a judiciary, and argue that both should be institutionalized in MSIs, e.g., by the creation of well-developed independent administrative and adjudicative bodies. We also point to the contribution of constitutionalization for the development of functions necessary for democracy and learning in MSIs—an element that escapes the attention of Mena/Palazzo and Hahn/Weidtmann. Below, we discuss the two challenges we identified—the demarcation of the dèmos and a more comprehensive use of Habermas’ conceptualization of the institutionalization of deliberative democracy—to provide a framework for the analysis of MSIs such as the EPs. After these elaborations, we apply this framework to the EPA. In doing so, we not only show that such an MSI can indeed be said to have a dèmos rather independently of nation-states, but also that on this basis the five Habermasian elements of deliberative democracy can be sensibly conceived in the context of an MSI and that our framework helps to assess the democratic qualities of the EPA. The application of a Habermasian approach to the institutionalization of deliberative democracy for the direct engagement of stakeholders in MSIs requires a solution to the potential problems that Mäkinen and Kourula (2012) as well as Whelan (2012) identify with regard to the use of Habermasian ideas. They argue that Habermas’ account does not offer the conceptual resources for understanding how MSIs can be democratized independently of the democratic institutions of nation-states. We agree with these considerations: Habermas (2009) assumes indeed that the democratization of transnational regulatory structures, such as those of MSIs, necessarily depends on dèmos, representation and enforcement of nation-states and supranational organizations. If that would be true, there would be no possibility for understanding democracy in MSIs as the direct democratic involvement of stakeholders. However, Habermas does not explore the possibility that these MSIs could have their own dèmoi and that the institutionalization of a democratically organized engagement of stakeholders that make up these dèmoi could lead to the democratization of these initiatives independently of nation-states. In case there is a systematic way to identify the dèmos of an MSI—which is something that Mena/Palazzo as well as Hahn/Weidtmann assume, but not elaborate—then it could make sense to assess democracy in MSIs along the lines of Habermas’ five regulative elements for the institutionalization of deliberative democracy. To make Habermas approach available for the assessment of democracy in the institutionalization of the direct engagement of stakeholders in MSIs, we will therefore argue that MSIs can be democratized relatively independently of the dèmoi of nation-states and supranational organizations. All those that are otherwise affected by the initiative—and are neither authors nor addressees—should be engaged following Habermas’ general discourse principle. (ad 1) Although the dèmos of a voluntary and self-regulatory soft-law MSI is not constituted through citizenship as in the case of nation-states, such an initiative can (still) be said to have a dèmos. To understand how this is possible, we must start by highlighting an important difference between nation-states and transnational MSIs: The demarcation of the dèmos of a nation-state implies the existence of a people that is mainly delimited from other peoples by territorial boundaries and by their identification with the nation (state). Nation-states regulate all sorts of issues that are encountered by citizens who live in the same territory, and for which they jointly develop, maintain and obey regulations. MSIs, on the contrary, do not have a territorially delimited ‘people’ and do not regulate all sorts of issues within the territory (Dryzek and Niemeyer 2008; Scholte 2002). Rather, they are characterized by participation that transgresses territorial boundaries, and the primary reason for their existence is the establishment of regulation for a specific or limited set of issues that are not related to a particular national territory (Dryzek and Niemeyer 2008). For example, the Forest Stewardship Council (FSC) regulates the sustainable production of wood and timber; the Internet Corporation for Assigned Names and Numbers (ICANN) regulates the worldwide use of internet protocols; and the EPA regulates socio-environmental risks in project finance transactions. Stakeholders do not identify with an MSI because they live in the same territory or belong to the same people, but because they have reasons to recognize the issue(s) that the MSI addresses and to develop regulation(s) with regard to it or to submit themselves to them. Stakeholders that jointly lay down regulations and/or submit themselves to these kinds of regulations are operating as a collective actor (List and Koenig-Archibugi 2010; List and Pettit 2011; Saunders 2012) with the purpose of dealing with certain issues. Those stakeholders that develop regulations of an MSI and/or are submitted to them make up the dèmos of a voluntary and self-regulatory soft-law MSI. Hence, the boundaries of the dèmos of an MSI are somewhat fluid: Anytime a group or an individual chooses to become part of the regulatory regime of an MSI (or decides to leave it), the MSI-dèmos changes accordingly. (ad 2) Yet, soft-law MSIs have more stakeholders than those that develop the regulations of the initiative and are addressed by them. With regard to transnational regulation, a distinction is often made between the actors who develop the regulations of a regime as rule-makers and standard-setters, the addressees (of the regulations) to whom the standards apply, and the otherwise affected who experience (in-)direct consequences of the application of these regulations (Cafaggi 2011). On our account, in which we conceptualize the dèmos of a transnational MSI as a collective actor consisting of those developing the regulations and submitting themselves to it, the otherwise affected are not part of the dèmos. An MSI may have various stakeholders that do not belong to its dèmos, and from the perspective of collective agency it would be unwise to just relax the definition of the dèmos in order to include them. The perspective of collective agency shows that the possibility of democratic decision-making in an MSI does not only depend on its democratic procedures; it also requires that ‘its level of internal diversity does not prevent successful collective decisions and coordinated actions’ (List and Koenig-Archibugi 2010, 110). All collective agents need to draw certain boundaries of inclusion and exclusion (i.e., insiders vs. outsiders) to guarantee for sufficient ‘internal cohesion’ and to avoid paralyzing decision-making and the coordination of actions. That is, they need to draw a line between those that are merely affected by the regime and those that are subjected to its regulation and democratically engaged in developing it. This necessity is also recognized by Habermas, who considers nation-states as collective actors whose members identify with their community (Habermas 1996, 97f. and 156f.). His democratic principle of legitimacy—which states that ‘only those statutes may claim legitimacy that can meet with the assent of all citizens in a discursive process of legislation’ (Habermas 1996, 110)—is valid for legal self-regulation inside national communities. This, however, does not imply that those that are not addressed, but only affected by the regulations of an MSI do not merit consideration—to the contrary. Habermas’ (1996) conception of democracy suggests that in nation-states deliberative democracy is institutionalized in a constellation of five differentiated, but connected elements that we briefly summed up above. These institutional elements can realize the democratic engagement of the members of the dèmos in the development of the regulations to which they jointly submit themselves. We have described a way to demarcate the dèmos of an MSI and thus fulfilled a central precondition for analyzing the institutionalization of the direct engagement of stakeholders in transnational MSIs along the lines of the five Habermasian elements of deliberative democracy. Although these institutional elements have been developed for national democracies, they can also be used as indications for the way in which democracy can be institutionalized in MSIs. This task, however, demands a re-specification of the five elements for the engagement of the members of the MSI-demos. Moreover, this re-specification should also provide for a conceptualization of the engagement of otherwise affected stakeholders in dialogs, and the consideration of their interests and values in decision-making. We specify these institutional elements of deliberative democracy in the following paragraphs to provide a framework for the assessment of the democratic qualities of transnational MSIs, and of its legitimacy regarding otherwise affected stakeholders. For each of the Habermasian elements, we present a brief discussion of its general meaning, followed by an elaboration of its specific meaning in the MSI-context based on recent research in the fields of political philosophy, juridical theory and international relations research. The core of deliberative democracy is that the regulations to which the participants of a political community—the members of the dèmos—submit themselves should be based upon public discussion in which those addressed by the rules can debate their interests and convictions (Habermas 1996). All addressed, all members of the dèmos, should be able to participate in discussions. Such discussions are necessary to find ways to jointly realize (potentially conflicting) interests and thus develop a reasoned public will that can inform representational decision-making about rules, the administration of these rules as well as adjudication in cases where interpretation and conflict resolution are required (Habermas 1996, 97f.). With regard to ethical-political discussions, Habermas explains that when, ‘for technical reasons’, not everyone can take part in an actual discussion, a dialog of representatives should be accepted: ‘Discourses conducted by representatives can meet the condition of equal participation on the part of all members […] if they remain porous, sensitive, and receptive to the suggestions, issues and contributions, information and arguments that flow in’ (Habermas 1996, 182). Following Habermas’ discourse principle (Habermas 1996, 107) we propose that in the case of MSIs, where regulations are often highly consequential for otherwise affected stakeholders that do not belong to the dèmos, these ‘non-members’ should also have access to stakeholder discussions to establish legitimacy of regulations beyond the political community of the initiative. The exertion of influence on the attention and interpretation frames of decision-makers (Dryzek 2013, 344ff.). These ‘inter-subjectively tested’ discourses can become part of the deliberations in decision-making. Legitimacy of regulations requires the formal representation of all addressees in decision-making concerning these regulations (Habermas 1996, 169f. and 183) as well as the consideration of the arguments of all otherwise affected stakeholders by the representatives of the dèmos (Habermas 1996, 107). In nation-states, democracy implies the representation of all citizens of the geographically bounded dèmos in a legislature by giving them all an equal vote in choosing their representatives. In the case of an MSI, this approach to representation may be infeasible given that the members of its dèmos are often dispersed over large areas. In some cases, it might even include various groups of people that are only moderately aware of their connection to the MSI and/or ignorant of the idea of democracy (Scholte 2002). Moreover, if the boundaries of the dèmos of an MSI are fluid, and can change easily and at any time a stakeholder becomes submitted to the regulations of the MSI, then proportional representation of all actual constituents of the dèmos may be unpractical and violate the spirit of democracy. In such cases, a solution consists of replacing the representation of each individual member of the dèmos by a representation of the different discourses (i.e., different sets of perspectives, topics, meanings and values that are persistently articulated by stakeholders in discussions and that form relatively stable positions in stakeholder dialogs (Dryzek and Niemeyer 2008; Dryzek 2013)). The application of regulations that have been made in representative decision-making requires the separate institutionalization of an administration. An administration does not justify regulations, but takes regulations that have been justified in representative decision-making as a basis, and ensures that these rules are adequately implemented (Habermas 1996, 186). Administration is thus at the same time based upon and limited by democratically developed regulations. The specification of the practical meaning of these regulations in concrete guidelines, including clear rights and obligations, the monitoring of the observance of these guidelines as well as the sanctioning of disobedience, are among the main tasks of the administration (Habermas 1996, 134). Just as in nation-states, the rational understanding that obeying democratically developed regulations of an MSI is in the interest of all members of the dèmos is insufficient for understanding how to comply in practice and for motivating compliance. An administration with executive and coercive powers is also needed in MSIs to establish how to follow the rules, how to monitor rule-obedience and how to punish non-compliance. The sanctions available to the administration of an MSI take a different form compared to those of nation-states. Transnational MSIs do not have a monopoly on the (legitimate) use of force and other hard law sanctions. Nevertheless, they can and do sanction stakeholders that violate the respective rules and standards. For instance, Rugmark, an MSI that aims to abolish child labor in the carpet industry, punishes the violation of its norms through public naming and shaming and the (temporary) suspension of certificates (Take 2012, 235). Both naming and shaming and the suspension of certification can be powerful (soft-law) sanctions for MSIs. Moreover, MSIs can call in the help of third parties for monitoring, and they can, together with nation-states, organize a ‘distribution of labor’ regarding monitoring and sanctioning of rule-compliance—with MSIs executing the ‘normal monitoring and sanctioning’ and national administrative bodies taking the responsibility for ‘hard’ cases of norm violations (Verbruggen 2013). Any set of regulations, no matter how democratically developed and carefully administrated, requires the possibility of a reasoned judgment regarding the adequacy of its application, and in case of norm violation a verdict and respective consequences (i.e., sanctions). Judgments involve interpretations that close the void between rules and factual situations in which parties appeal or refer to those rules. The adjudication of rules is a political act in the sense that it involves not only an understanding of the articulated will of the dèmos, but also a further articulation and development of this will. Adjudication involves solving conflicts between presumed legitimate claims while simultaneously preserving consistency with the rules and their applications in earlier cases (Habermas 1996, 234ff.). It establishes fair decisions for those engaged, but also enhanced certainty about the meaning of regulations in specific situations (Habermas 1996, 197). Fair and predictable adjudication demands procedural standards that ascertain the public accessibility of judgments, the provision of reasons for these judgments, due process (i.e., hearing the defendant and confronting the evidence), as well as the possibility of lodging an appeal against a judgment. In short, it demands the ‘rule of law’ (Waldron 2008). This requires, in particular, independent specialized bodies for adjudication (Habermas 1996, 237). The adjudicating functions and procedures that are indicated above—and that are typical for nation-states—can nowadays also be found in MSIs. In some MSIs, regulation is increasingly a matter of rule of law (Thompson 2012; Kingsbury et al. 2005). This could enhance the fairness of their regulations and the consistency and predictability in terms of rule-application. 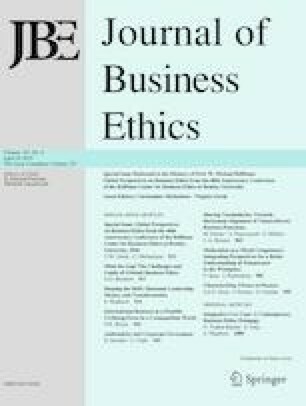 The systematization of dispute settlement could thus also improve the general level of trust in an MSI and provide fairness and certainty to its stakeholders. Through a constitution, the members of the dèmos give themselves a legal-normative description of the main political aims and structures of their collective. In a democratic collective, the constitutional documents contain principles that determine the formation of a self-governing, collective agent (Habermas 2001, 767f.). In the case of a transnational MSI that is directed to an issue such as socio-ecological risk management in project finance transactions (i.e., the EPs), the basis of the constitution consists of a joint mission statement that delineates the key issue(s) the participants aim to deal with. In relation to this, the constitution also defines who can be considered a member of the dèmos. Moreover, it settles the way in which the stakeholder–addressees can (indirectly) be the makers of the rules they submit themselves to, and how the views of the otherwise affected stakeholders should be dealt with in decision-making. For this purpose, the constitution provides basic stipulations for the institutionalization of the four regulative elements discussed above—with regard to stakeholder discourses, representative decision-making about regulations, adjudication and implementation. Lastly, it contains rules and procedures that specify how and under which circumstances the constitution itself can be changed and amended without the MSI losing its identity (Rosenfeld 2011). Constitutional reforms—in nation-states as well as within transnational MSIs—often reflect ongoing learning, implementation experiences and emerging good business practices. In general, a constitution as a universal framework document has a normative status in the sense that it provides the basis for other rules of the MSI, and these rules can be assessed and adjudicated with reference to the constitution. The constitution thus gives guidance for the further development and advancement of the other institutional (governance) elements of an MSI (Habermas 2001, 768). In what follows, we assess the democratic qualities of the EPA by means of the framework we have developed above. This assessment shows that the specification of Habermas’ conception of deliberative democracy, developed in the foregoing section, can indeed be applied fruitfully to transnational regulatory networks. We first describe the general characteristics of the EPA followed by an analysis of how and to what extent the EPA’s Governance Rules institutionalize the engagement of stakeholder groups through the five Habermasian elements of deliberative democracy (including an identification of the most important stakeholder groups of the EPA). The EP-standards for environmental and social risk management apply globally to the following four financial market products. The EPs are based on the Performance Standards on Environmental and Social Sustainability of the International Finance Corporation and the World Bank Group’s Environmental, Health, and Safety Guidelines. They are adopted by so-called Equator banks or EPFIs, that is, financial institutions which are active in the project finance sector. The EPFIs commit themselves to not providing loans and credits to projects where the borrower is not able or willing to comply with the respective social and environmental standards and guidelines. As of today, 89 financial institutions from 37 countries and six continents have adopted the EPs. According to official data provided by the EPA, the EPs cover over 70% of international project finance debt in emerging markets and developing countries (EPA 2016). The overall aim of the EPs is the promotion of environmental (i.e., protection of project-affected ecosystems) and social (i.e., respect for human rights) sustainability in the (project) finance industry (EPA 2013, 20). To reach these goals, the EPs impose obligations on both lenders (EPFIs) and borrowers (clients), in particular with regard to review and categorization (principle 1); environmental and social impact assessment (principle 2); environmental and social management systems and action plans (principle 4); stakeholder engagement (principle 5); grievance mechanism (principle 6); monitoring (principle 9); and reporting (principles 9 and 10). These obligations get formalized as covenants (principle 8), which are part of the loan documentation or investment agreement between the EPFI and the project developer. The EPA is the unincorporated association of EPFIs established in 2010. The association’s objective is the ‘management, administration9 and further development of the EPs’ (EPA 2016). It is governed by a set of Governance Rules which specify the internal governance structures as well as decision-making procedures10 within the EPA. Two governance levels have to be distinguished: the ‘management’ level and the ‘administrative’ level of the secretariat (Fig. 1). The management level consists of the Steering Committee which is responsible for the management and further advancement of the EPs as well as the coordination of administrative tasks. EPFIs become members of the Steering Committee on the basis of a rotation principle for a maximum of three years. Among the members of the Steering Committee, one EPFI gets elected as chair of the Steering Committee. The chair functions as the speaker and provides coordination. The Steering Committee can set up permanent or temporary working groups fostering the inclusion of stakeholder groups. One of the main tasks of these working groups is to discuss governance and implementation issues and to provide guidance to EPFIs with regard to the further advancement of the EPs. Currently, nine working groups exist, including the ones on capacity building and training, consistency, external relations (i.e., communication with external stakeholders such as NGOs and civil society organizations), biodiversity, climate change, social risk and regional outreach. The second level of the EPA is the so-called administration level consisting of the EP-Secretariat. The Secretariat manages the everyday running of the EPA. In particular, the Secretariat is responsible for the EP-Web site, internal and external communications, public relations, advice and assistance with regard to adopting and implementing the EPs and the management of financial affairs. By means of our previous definitions, we explain which groups belong to the dèmos of the EPA, that is, which groups are actors in the establishment of the EPs and which groups are addressed by them. We also indicate which groups are ‘otherwise affected’, and should therefore be engaged in stakeholder discussions, and influence EPA-decision-making. The main stakeholders of the EPs include (a) the ‘Equator banks’ or EPFIs; (b) the EPFIs’ clients, that is, project developers and operators; (c) civil society organizations and NGOs; and (d) project-affected communities, such as indigenous peoples. Below we explain whether they belong to the group of actors, addressees or otherwise affected stakeholders. The actors group comprises all stakeholders that are formally engaged in articulating, reviewing and updating the EPs and the rules and procedures of the EPA. This group contains the ‘Equator banks’ that are officially engaged in maintaining and adjusting the EP-framework. The addressees group contains all those financial institutions that are required to implement the EPs into their socio-environmental risk management and due diligence frameworks, namely the EPFIs. Furthermore, it contains all the EPFIs’ clients, that is, project developers and operators. They are expected to fulfill the requirements laid down in the EPs. These obligations are imposed by the lender upon the borrower, and they get formalized as covenants. The EPs thus regulate the business conduct of EPFIs as well as the business conduct of their clients. The actors and addressees together form the dèmos. Hence, the boundaries of the EPA-dèmos are somewhat fluid: Every time a new bank enters the EPA and becomes an EPFI, and every time a client decides to obtain financial means from an ‘Equator bank’ and thus submits itself to the EPs, the dèmos of the EPA changes, respectively. The group of all otherwise affected stakeholders consists of civil society organizations and NGOs as well as project-affected local communities: Neither the EPs nor the Governance Rules of the EPA apply to them directly; therefore, they do not belong to the dèmos of the EPA. These groups are nevertheless indirectly affected by the application of the EPs and in particular by the industrial and infrastructure projects that are financed under the EPs (e.g., coal, oil and gas projects; (mountaintop removal) mining projects; bridges, dams and power plants projects). Although these communities and organizations are not part of the actual dèmos, they should be engaged following Habermas’ general discourse principle. That is, they should have access to stakeholder discussions and their interests and values should be considered in decision-making to obtain general legitimacy of the regulations established by the actors and addressees (Saunders 2012). At present, four main stakeholder discussions can be distinguished—two formal and two informal ones: The two formally organized discussions take place within the EPA and its working groups (cp. paragraphs 1 and 2 below), while the two informal discussions take place within the Thun Group of Banks, and other subgroups of (non-)EPFIs (3), and among finance NGOs, such as BankTrack, and the general public (4). In what follows, we describe for each of the discussions, first, the various types of (stakeholder) communication surrounding the EPs. In a second step, we critically analyze and evaluate them from a Habermasian perspective—based on the criteria of accessibility of the discussions for all stakeholders (which is a precondition for the articulation and clustering of meanings, topics, values and interests in typical discourses that can influence decision-making) and availability of relevant information to all (which is a precondition for meaningful discussions as such). (ad 1) Discussions surrounding the official EPA-review and update process: The last review and update process took place between 2010 and 2013. It consisted of an internal consultation phase that yielded a first draft of EP III, a second phase that gave all other stakeholder groups the chance to comment on the initial draft and to make suggestions for further improvement, and a last phase in which the third generation of the EPs was finalized and launched The invitation to comment on the proposed revision of the EPs, in the second phase of the update process, provoked various responses from stakeholders (e.g., (finance) NGOs) and interactions among them (e.g., between NGOs, EPFIs and the EPA). These interactions in the context of the review process are a good example of a discussion among stakeholders from within and beyond the dèmos of the EPA. They can contribute to the transformation of interests and values and help to find ways to inform representative decision-making and thus jointly set and realize the goals of the EPA. The problem from a deliberative democracy perspective is that the EPFIs do not engage with NGOs and other stakeholders on a regular (formal) basis, e.g., within a stakeholder forum or advisory group being part of the EPA, but only incidentally. (ad 2) Discussions within the working groups of the EPA: Many of the discussions about the purposes, content and functioning of the EPs take place within the working groups. Although these working groups cover the majority of the issues and discourses that may be important to other stakeholder groups of the EPs, they are solely accessible for bank representatives. Only the ‘Biodiversity for Bank’s (B4B) program, that was co-launched together with the World Wildlife Fund (WWF) and the Business and Biodiversity Offsets Program (BBOP),11 contains (a basic form of) stakeholder engagement and makes use of civil society input and expertise. It is this severely limited access of other stakeholders to the working groups that hinders the development of stakeholder discussions that could form the basis for representational decision-making, administration and adjudication within the EPA. Both formally organized discussions described above suffer from a lack of publicly disclosed information about the actual functioning of the EPA and the on-the-ground outcomes of the EPs. For many interested stakeholders, it is almost impossible to find out what has been discussed within the EPA in general and the Steering Committee in particular. The public disclosure of information and public consultation are often prevented by confidentiality duties toward the association and/or the EPFIs’ clients (Richardson 2005; Mikadze 2012; BankTrack 2011; Wright 2012). Both intransparency and the lack of information hinder the establishment of meaningful stakeholder dialogs. (ad 3) Discussion within the Thun Group of Banks: The so-called Thun Group of Banks consists of seven leading international banks, six ‘Equator banks’ (Barclays, BBVA, Credit Suisse, ING Bank, RBS Group and UniCredit) and one non-EPFI (UBS). In 2013, the Thun Group of Banks published a draft paper on banks and human rights (Thun Group of Banks 2013). The paper provides a first guide to the banking sector for operationalizing the UN Guiding Principles on Business and Human Rights (Ruggie 2013; United Nations 2011). During the drafting process itself, apparently no meaningful consultation and engagement took place with affected stakeholder groups such as NGOs, civil society organizations and human rights activists (BankTrack 2013, 2). This implies that the initial discussions within the Thun Group of Banks were insufficiently accessible for many stakeholder groups. As a consequence, the paper has been criticized for its poor stakeholder engagement (BankTrack 2013; de Felice 2015). Interestingly, however, the exclusive discussions within the Thun Group of Banks provoked much broader and, in a sense, more fruitful discussions among financial institutions, practitioners and academics. Especially, the discussions on human rights due diligence might initiate and stimulate the next EPA-review and update process. If developed further (in particular with regard to the transparency and availability of information), these could be made open to all and could therefore provide a basis for representative decision-making, administration and adjudication. (ad 4) Discussions initiated by NGOs and civil society organizations: Besides functioning as watchdogs, NGOs (and other civil society organizations) contribute to the EP-discussions among practitioners and academics by publishing case studies and project-related data on their Web sites (including data documenting the respective environmental, social and human rights violations associated with the different projects financed under the EPs). These reports help in assessing single companies (both financiers and project developers/operators), whole industry sectors and/or individual (controversial) projects. BankTrack and other finance NGOs have also released documents that propose reform measures that could help to prevent ‘dodgy deals’ and to strengthen the EP-framework. These documents point out institutional shortcomings as well as potential ways in how to overcome them (BankTrack 2011, 2012; Lazarus and Feldbaum 2011; Lazarus 2015). In short, finance NGOs are able to sensitize key actors in the project finance industry (and beyond); they help to raise awareness for crucial socio-environmental and human rights issues; and they are able to put pressure on the main stakeholders (i.e., EPFIs and EPA) to take further action toward the full realization of the EPs’ potential. The activities of NGOs thus constitute a stakeholder discussion in itself, but also initiate further dialogs among banks, civil society and researchers. These dialogs are in principle open to all, provide relevant information to the public, put major banks under reputational pressure, and challenge the organizational legitimacy of the EPA and their member institutions. If the EPA would institutionalize mechanisms to systematically consider these discussions in the development of the EPs, this would represent a move toward (more) deliberative democracy. The analysis so far has shown that several stakeholder discussions take place inside and outside of the EPA. The formally organized discussions suffer from a lack of accessibility and limited availability of information. This diminishes the legitimacy of the EPs. Nevertheless, these somewhat underdeveloped formal stakeholder discussions have spurred various informal, open stakeholder discussions involving public information about a variety of issues and discourses that have emerged within civil society. These informal discussions could build the basis for representative decision-making, administration and adjudication. At present, formal decision-making within the EPA is a matter of EPFIs only. The participating banks are the only (stakeholder) group that is officially engaged in maintaining and adjusting the EP-framework (recall that only banks can become member of the EPA’s Steering Committee and the respective working groups). Democracy, however, demands that (the representatives of) all stakeholder groups addressed by the respective rules (in this case, the EPA’s Governance Rules) should be involved in associational decision-making—at least with regard to the respective discourses. This is clearly not (yet) the case, since project developers and operators are excluded from associational decision-making procedures. Besides, the Governance Rules concerning the Steering Committee and the working groups give no systematic, institutionalized voice to (the discourses of) otherwise affected stakeholder groups. This, however, is demanded to establish the general legitimacy of network regulation. The limitations of representation in formal decision-making are understandable against the background of the characteristics of the dèmos of the EPA: All EPFIs’ clients belong to the dèmos, but they are dispersed all over the world. In addition, they are not necessarily aware of the affairs of the EPA and they may not be familiar with democratic decision-making. Moreover, the boundaries of the dèmos are rather fluid since its composition changes each time an EPFI acquires a new client or loses one. A problem that complicates the systematic consideration of the views of otherwise affected stakeholders in decision-making is the high number of very diverse local communities that are (potentially) affected by the EP-framework, as well as the many NGOs and civil society organizations that bring forward numerous socio-environmental interests. These circumstances suggest that representative decision-making may be better served by a representation of discourses, rather than by a (proportional) representation of stakeholders. Indeed, various discourses can be distinguished within the stakeholder discussions that we identified above. For instance, there are discourses related to banks and human rights (e.g., with regard to human rights due diligence and covenants); climate change (e.g., whether banks should divest from fossil fuel industries and coal, oil and gas companies); (FPIC-based) stakeholder dialog and engagement (in particular with regard to indigenous communities); or the extension of the (regional) scope of the EP-framework (e.g., ‘going beyond project finance’ and/or whether an outreach strategy toward the emerging markets is required to level the playing field). These discourses could serve as a basis for the representation of the addressees of the EPs and for the systematic consideration of the view of otherwise affected stakeholders in decision-making. From a Habermasian perspective, the administration of an MSI has three major roles to fulfill: (1) concretizing and specifying the rules for implementation; (2) monitoring (non)compliance; and (3) sanctioning rule-infringement. (ad 1) Providing concrete guidelines for the implementation of MSI-regulations: The EP-Secretariat, currently consisting of two members of staff, is responsible—among other things—for giving advice and assistance with regard to adopting and implementing the EPs. The EP-implementation note ‘… contains selected information and examples to support the understanding of the requirements in, and implementation of, the Equator Principles …’ (EPA 2014, title page). Both the EPA’s Governance Rules and the EP-disclaimer state however that ‘… the Equator Principles do not create any rights in, or liability to, any person, public or private’ (EPA 2013, 11). This implies that the EPFIs can adopt and implement the EPs at their own discretion. Therefore, at present the EPA is to be considered a rather informal organization mainly based on individualized (voluntary and self-regulatory) rule-specification. (ad 2) Monitoring (non-)compliance: In reality, the EPs suffer from inadequate monitoring mechanisms. For instance, up to today, EP-compliance relies mainly on passive (non-EPA) monitoring (Sarro 2012 1542ff. ): Civil society organizations and NGOs function as informal monitoring institutions and watchdogs (O’Sullivan and O’Dwyer 2009). In case of apparent non-compliance, they might start advocacy campaigns and/or protest movements and customer boycotts. This form of civil society criticism often causes public outcry and thus exposes non-compliance to the EPA, its members and other stakeholders. Yet, so far there is (almost) no proactive engagement in terms of monitoring; a credible independent and transparent form of monitoring and control is (mainly) lacking. (ad 3) Sanctioning non-compliance: The self-regulatory EP-regime lacks a credible deterrent, since effective sanctions for rule-violations are lacking. The question therefore comes up whether the EPs have enough ‘legal bite’ to penalize participants that fall behind their voluntary socio-environmental commitments? Currently, the EPFIs face only little sanctions from the side of the EPA should they not comply with the EPs. A (temporary) delisting is possible according to the EPA’s Governance Rules, if ‘Equator banks’ fail to report publicly or if they fail to pay the annual membership fee. Only in these cases will ‘Equator banks’ be excluded from EPA-membership. A re-adoption, however, is still possible. The regulations of the EPA do not entail the possibility to delist a company because of non-compliance and/or violation of the EPs (EPA 2010/2013, 26). So far only public naming and shaming campaigns initiated by NGO–watchdogs might put EPFIs and their clients under (reputational) pressure. Yet this ex-post way of sanctioning cannot be steered and/or applied by the EPA for rule-enforcement. It is thus insufficient to prevent non-compliance and practical failure, e.g., in the form of financing ‘dodgy deals’. In summary, we can conclude that the EP-framework suffers from a lack of adequate administrative mechanisms. A major underlying problem relates to the EPA being understaffed and underfunded: The budget remains low compared to other MSIs and covers only the costs for the secretariat, the Web site and annual meetings. 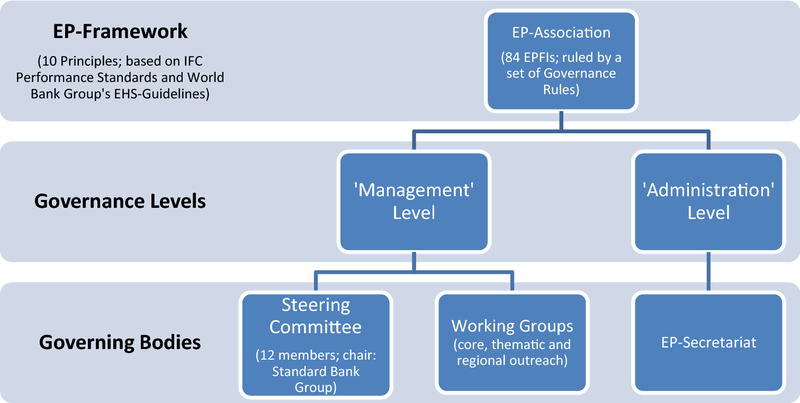 Moreover, the management structure of the EPA is rather loose and ‘handled by EPFIs, who, in addition to their other responsibilities within their financial institutions, volunteer their time as EP-chair, Steering Committee members and leaders and members of Working Groups’ (Lazarus 2015, 134). So, while the autonomy and independency of the functions of specification, monitoring and sanctioning is central to democracy in the EPA, these functions are—out of necessity—executed by the EPFIs in a more or less arbitrary way. Especially under this condition of serious ambiguity, an independent adjudicating body is essential for arriving at interpretations of regulations that are fair (with regard to the engaged stakeholders), consistent (with the overall rules) and predictable (given earlier adjudications). Interpretations are now made by the EPFIs themselves without a further systematic consideration of other stakeholders. This implies that the act of solving potential conflicts between legitimate claims of stakeholders while maintaining the consistency of the regulations lies solely in the hands of some of the EPFIs without much guarantees for independent adjudication. In the absence of a developed administration and independent adjudicating body, the specification and interpretation of the EPs and other regulations of the EPA remains arbitrary, and disconnected from the values and expectations of the other members of the dèmos as well as the otherwise affected stakeholders. The constitutionalization of the EP-framework and the EPA can be found in the EPs themselves as well as in the EPA’s Governance Rules. Both documents provide descriptive and normative stipulations with regard to (1) the main aims and key issues of the association; (2) the core members of the association and its other (external) stakeholders; (3) the participation of the respective stakeholders in discussion and decision-making; and (4) the organization of implementation and rule-enforcement. (ad 1) The main aims of the EP-framework, formulated in the principles, include the identification, assessment and management of environmental and social risks and impacts in project finance. In doing so, the EPs seek to promote ‘sustainable environmental and social performance’ and ‘improved financial, environmental and social outcomes.’ They also acknowledge ‘the importance of climate change, biodiversity, and human rights, and believe negative impacts on project-affected ecosystems, communities, and the climate should be avoided where possible. If these impacts are unavoidable they should be minimized, mitigated, and/or offset’ (all: EPA 2013, 2; cp. EPA 2010/2013, 4). These aims and issues clearly state which values and goals should be considered important and thus give the EPA a framework for the evaluation and improvement of existing institutional provisions, in case they appear to be insufficient for their realization. (ad 2) The definition of the dèmos of the EPA is part of the official statement of the EPs and includes all EPFIs; that is, all those financial institutions that are active in project finance, project finance advisory services and project-related corporate loans (and bridge loans) (EPA 2010/2013, 1). Every financial institution that is active in the project finance industry and that wants to commit itself to the EP-framework can become a member of the EPA and can thus be represented in associational decision-making. To remain a member, EPFIs need to report on an at least annual basis and pay the annual membership fee. Further (minimum) entry criteria that have to be met prior to becoming a member of the EPA do not exist. On the basis of our conceptualization, the dèmos of the MSI should be made up of all those addressed by the regulations that have been drawn up for a collective purpose. In the EP-framework, the EPFIs recognize merely their own role as financiers with ample ‘opportunities to promote responsible environmental stewardship and socially responsible development, including fulfilling [the] responsibility to respect human rights’ (EPA 2013, 2). However, they neglect the equally important role of the financed projects in promoting these goals as well as the fact that (most of) the regulations of the EPA apply to the EPFIs’ clients, which make them an essential part of the dèmos. The present EPA-definition narrows down the dèmos of the EPs too much by excluding project developers and operators from the EP-dèmos. (ad 3) EPA-membership is restricted to project finance banks. Consequently, they are the only members represented in the associational decision-making bodies. This implies the exclusion of other groups of addressed stakeholders, that is, the project developers and operators. Moreover, the consideration of otherwise affected stakeholders is insufficiently embedded in the constitutional documents of the EPA. Neither the EPs nor the EPA’s Governance Rules stipulate how these stakeholders could be represented or considered in associational decision-making. Seen from the perspective of legitimate self-regulation and given the established goals and values of the association, the ‘EP-constitution’ is too restrictive in its articulation of representative decision-making. (ad 4) So far, there are no basic rules and/or organizational mechanisms defined in the constitutional documents of the EPA that state how the EPA should deal with adjudication, monitoring and sanctioning. In sum, we can conclude that the main issues the EPs aim to address are officially established in the constitutional documents of the EPA and that a relatively precise, yet (too) narrow definition of the dèmos is explicitly formulated there. Moreover, the currently existing arrangements for decision-making are laid down in the EPA’s constitutional documents. However, the current arrangements exclude several groups of addressed stakeholders from representation, and all affected stakeholders from consideration in decision-making. The other regulative elements of deliberative democracy (administration and adjudication) are largely absent in the EPA, and this is—unfortunately—also reflected in its constitutional documents. From our perspective of deliberative democracy, the present constitutionalization is nevertheless an important element of democracy for the EPA as it facilitates institutional learning processes. Even a constitution that is insufficiently developed from this perspective can serve as a starting point for reflection and improvement if the stated aims are (a) considered in relation to the ideal of deliberative democracy and (b) compared to the present arrangements (or lack thereof) for the demarcation of the demos as well as for stakeholder dialogs, decision-making, administration and adjudication. Stakeholder discussions should be open to all, and relevant information should be available to all participants. This could be achieved by opening up the formal discussion among EPFIs for other stakeholders (e.g., NGOs, civil society organizations and project-affected communities) and by providing the necessary information to all interested stakeholders. Moreover, a change from incidental stakeholder consultations that can spur discussions—such as in the EP-revision and update processes—to a continuous and ongoing dialog related to human rights and environmental, social and governance issues seems necessary. Provided that stakeholder discussions are working properly, the institutionalization of the representation of discourses in decision-making would provide a solution for the representation of EPFIs and their clients. That is, the discourses of project developers and operators (the constituents of the dèmos) should be represented in associational decision-making. This form of discourse representation à la Dryzek could be achieved by changing the decision-making rules of the EPA that presently give voice/vote only to EPFIs. The consideration of (all) otherwise affected stakeholders in decision-making could be organized by means of (more or less) continuous consultation of representatives of the discourses that otherwise affected stakeholders maintain within the stakeholder discussions. Consultation of the discourses of stakeholders such as environmental, social and finance NGOs and local communities could be achieved via an EP-stakeholder forum as suggested by the reform commission of the EPA. To harden the governance structures of the EP-framework, the interpretation of the EPs (and other EPA-rules) in cases of conflict should not be left to the stakeholders engaged in a specific project. Of particular importance is the establishment of an independent adjudicating body through an associational conflict-resolution mechanism which might help with these issues (i.e., ‘soft case law’). The above reform proposals for the institutionalization of deliberative democracy should be constitutionalized through an update of the EPs as well as the EPA’s Governance Rules. This could (further) facilitate future discussions about EP-modifications. Habermas’ approach to deliberative democracy is often taken as a starting point for evaluating the political responsibilities of (multinational) corporations when they take on (self-)regulatory roles as rule-makers and standard-setters (Scherer and Palazzo 2007, 2008, 2011). Mäkinen and Kourula (2012) and Whelan (2012), however, have raised the concern that Habermas’ approach is too much based on ‘nation-state democracy’ to be directly applicable in the context of transnational MSIs. In response to this, we have argued that an application of Habermas’ concept of deliberative democracy to MSIs may be worthwhile, but only after a theoretical modification thoroughly addressing Mäkinen and Kourula’s (2012) and Whelan’s (2012) concerns. We have elaborated our theoretical modification in two steps: First, to resolve the issue of Habermas’ (alleged) ‘nation-state orientation’ and to realize an important precondition for conceptualizing the institutionalization of direct democracy in MSIs along Habermasian lines, we have argued that MSIs have a dèmos independently of the dèmoi of nation-states. The diverse stakeholders that jointly create an MSI cooperate as a collective to develop and apply regulations to deal with a perceived problem and to submit themselves to these regulations. From the normative perspective of democracy, those that develop the regulations of an MSI and/or are addressed by it make up its dèmos and should all be involved in democratic self-regulation. This delimitation of the demos of an MSI in no way implies the complete exclusion of non-addressed affected stakeholders. Following Habermas’ general discourse principle, the values and interests of otherwise affected stakeholders should be respected in decision-making to obtain general legitimacy of the regulations; yet, this is not a matter of democracy per se. Second, we have identified the five general institutional elements of deliberative democracy that can be found in Habermas’ work, that is, public discussions, representative decision-making, administration, adjudication and constitutionalization, which can guide the realization of democracy of pluralist collective actors. We have also explained how these five general elements can be re-specified for the context of transnational MSIs. Both theoretical problems have not yet been addressed in the literature on MSIs (Mena and Palazzo 2012; Hahn and Weidtmann 2016). These elaborations yield several more specific theoretical contributions to the academic literature on democracy and MSIs. Our framework differs from currently existing ones in five major aspects of ‘deliberative democracy for MSIs’: First, we demonstrate that the dèmos of an MSI deserves explicit attention and can be meaningfully distinguished (from the perspective of collective agency) as those making or being addressed by the regulations of the MSI. Second, we have argued on this basis that only the addressed should be democratically involved in decision-making. The otherwise affected stakeholders, which do not belong to the dèmos, should nevertheless be involved in stakeholder discussions and their values and interests should be taken into account in decision-making within the MSI. Their involvement and consideration should be regulated explicitly in the MSI. We thus provide guidelines and arguments for the identification and inclusion (or exclusion) of MSI-stakeholders as well as for the differentiation of roles of addressed respectively affected stakeholders in the MSI-governance processes. Third, we show that Habermas’ conception has more to offer with regard to the institutionalization of deliberative democracy than has been uncovered so far in articles that apply it to MSIs. Habermas’ five general functions should be realized to democratize governance in MSIs. Their specific realization in MSIs is, however, substantially different from their realization in nation-states and therefore demands explicit discussion. A comparison of our specifications for MSIs with the conceptualizations of Mena/Palazzo and Hahn/Weidtmann reveals that especially the functions of stakeholder discussions, administration, adjudication and constitutionalization are elements that are novel to the discussion, and enhance democracy when differentiated and regulated in transnational MSIs. Fourth, our approach stresses the interdependencies among the various elements of deliberative democracy: Not only representative decision-making, but also administration, adjudication and constitutionalization should contribute to democracy and legitimacy of regulation by MSIs. Finally, we emphasize the institutional learning and development opportunities that follow from constitutionalization. The application of our conceptualization of Habermasian deliberative democracy to the EP-framework illustrates that Habermas’ five regulative elements of deliberative democracy can indeed be used for assessments of transnational MSIs. It clarifies that the EPA is still far from being a democratic MSI and helps to identify institutional changes that could contribute to democratizing the EPA. Some of these institutional changes—such as the involvement of stakeholders in decision-making and the necessity to monitor rule-application—can also be identified by means of the existing frameworks of Mena/Palazzo and Hahn/Weidtmann. However, our approach also identifies institutional changes that would remain invisible from these perspectives. These concern (a) the differentiation of addressed and otherwise affected stakeholders of the EPA and the different ways of ensuring a legitimate engagement of these stakeholders, (b) the representation of the discourses within stakeholder discussions regarding the EPA instead of its stakeholders, (c) the development of an EPA-administration in which specification, monitoring and sanctioning are integrated, (d) the independent adjudication of the EPs and related regulations, and (e) an update of the normative self-descriptions that are formulated in constitutional documents of the EPA. Strengthening, in the sense of democratizing, the EPA could be achieved via the gradual and long-term institutionalization of deliberative democracy for MSIs, along the lines of the proposals above. MSIs such as the EPA can thus help to fill regulatory vacuums, while also helping to overcome democratic deficits in transnational regulations independently of nation-states. This situation of a ‘solitary’ corporation builds the background for Hussain and Moriarty’s (2016) proposal to remove corporations from a policy making role in political CSR and to reserve this role for representatives of civil society. Our paper is different in the sense that it analyzes the whole network of stakeholders and asks which characteristics this network should have in order to render it democratic. Functioning in such a network would require corporations to facilitate and respect these democratic qualities. Whether they do so or not is a question we cannot address here since it exceeds the (primary) scope of the paper. Cp. for the distinction between a Westphalian and a post-Westphalian world order (Conley and Williams 2011, 545; Held and McGrew 2007; Kobrin 2009; McGrew 1997; Rhodes 1996; Rosenau and Czempiel 1992). This modified Habermasian position seems to be insufficient when debating the boundaries of the dèmos under the current globalized conditions (Goodin 2007; Abizadeh 2012), as it excludes important categories of affected persons and organizations from influencing the rules which (might) have a considerable impact on them. We resolve this issue by arguing that Habermas’ general discourse principle requires the actors and addressees that together make up the demos of an MSI, to engage the otherwise affected in stakeholder discussions and consider them in their decision-making. Our position follows the line of Saunders (2012), List and Koenig-Archibugi (2010) and Song (2012). In an intense discussion with (among others) Goodin (2007) and Abizadeh (2012), they plea for a restriction of the dèmos of a democratic community to those addressed in the context of collective action, but at the same time demand that the (otherwise) affected are granted influence in the discussions and decisions of this community. Goodin and Abizadeh argue for the possibility of temporary extensions of the dèmos to allow the occasional inclusion of those affected by regulation. They admit that it is difficult to organize this practically. Saunders and Song point out that, besides practical problems, this strategy also has serious theoretical drawbacks. See for other ways of arriving at the representation of discourses (Dryzek and Niemeyer 2008). Cp. for an illustration the representation mechanism in the rule-setting body of the Forrest Stewardship Council (FSC) which is organized in different ‘chambers’ for social, environmental and economic discourses (with a further distinction between ‘North’ and ‘South’) with equal powers in decision-making (https://ic.fsc.org/governance.14.htm; Moog et al. 2015). The FSC, for instance, organizes ‘stakeholder consultation’ in the development of regulations (https://ic.fsc.org/en/certification/open-public-consultations). Most of the information and data presented in this paper is publicly available on the official EP-Web site and/or it is based on published material by academics, NGOs and finance ethics think tanks. Additional in-depth research—with the main purpose of verifying/falsifying certain information or data—has been conducted with the help of several semi-informal interviews with EPA-, IFC/World Bank- and NGO-officials and off-the-record conversations with top-level (European) EPFI-representatives. The term ‘administration’ refers here to the official language used by the EPA. It should not be confused with the Habermasian terminology as explained below. EPA-decision-making aims at consensus-seeking. Each EPFI has one vote; proposals are typically adopted when at least 50% of all EPFIs cast votes—so-called quorum of half—and when 66.7% of them vote in favor of a particular proposal (EPA 2010/2013, 13ff.). BBOP is an international cooperation between corporations, finance institutions, government agencies and civil society organizations (http://bbop.forest-trends.org/). Cp. for further loopholes and gray areas the EP-implementation note (EPA 2014); see also EPA (2010/2013, 15ff., 2014, 22). This includes new regulative arrangements as well as the further development of the organization of the EPs. The current lack of professional expertise and limited available resources, in particular, needs to be overcome: Higher dedicated resources and more professional staff are especially required when dealing with issues such as the development of an effective audit system for EP-reporting, the formulation of EP-adoption and entry criteria, the revision and update of the Governance Rules and the implementation of outreach activities in developing countries and emerging markets (cp. for more information on the proposed structural reform of the EPA, including enhanced funding and staffing and a professionalization of the association: Lazarus and Feldbaum 2011; Lazarus 2015, 134). In the academic literature, there is a debate going on whether MSIs like the EPs should implement a credible deterrent in the form of an enforcement pyramid (Ayres and Braithwaite 1992; Sarro 2012). BankTrack. (2011). The Outside Job. www.banktrack.org/show/pages/equator_principles. BankTrack. (2012). Tiny steps forward on the Outside Job. www.banktrack.org/show/pages/equator_principles#tab_pages_documents. BankTrack. (2013). BankTrack on the Thun Group Paper on Banks and Human Rights. www.banktrack.org/download/banktrack_on_the_thun_group_paper_on_banks_and_human_rights/banktrack_thun_group_paper_131119_0.pdf. de Felice, D. (2015). Banks and Human Rights Due Diligence. http://papers.ssrn.com/sol3/papers.cfm?abstract_id=2477126. EPA. (2010/2013). Governance rules. http://equator-principles.com/resources/ep_governance_rules_december_2013.pdf. EPA. (2013). Equator Principles. http://equator-principles.com/resources/equator_principles_III.pdf. EPA. (2014). EP-Implementation Note. www.equator-principles.com/resources/equator_principles_implementation_note_july_2014.pdf. EPA. (2016). Equator Principles Website. http://equator-principles.com/index.php/about-ep/about-ep. Lazarus, S., & Feldbaum, A. (2011). Equator Principles strategic review. www.equator-principles.com/resources/exec-summary_appendix_strategic_review_report.pdf. Thun Group of Banks. (2013). UN Guiding Principles on Business and Human Rights. Discussion Paper for Banks on Implications of Principles 16-21. www.csrandthelaw.com/wp-content/uploads/2013/10/thun_group_discussion_paper.pdf. United Nations. (2011). Guiding Principles on Business and Human Rights. www.ohchr.org/Documents/Publications/GuidingPrinciplesBusinessHR_EN.pdf.